Run down the beach as fast as you can, jump on the board, skim into the surf, repeat -- this is skimboarding. Running into a wave at high speeds and jumping onto a piece of wood is easier for the younger crowd that does not mind falling. If you prefer a learning curve with less sand in your face, start slow and practice at a moderate pace. Before purchasing a skimboard, you need to take in consideration your weight, height and skill level. 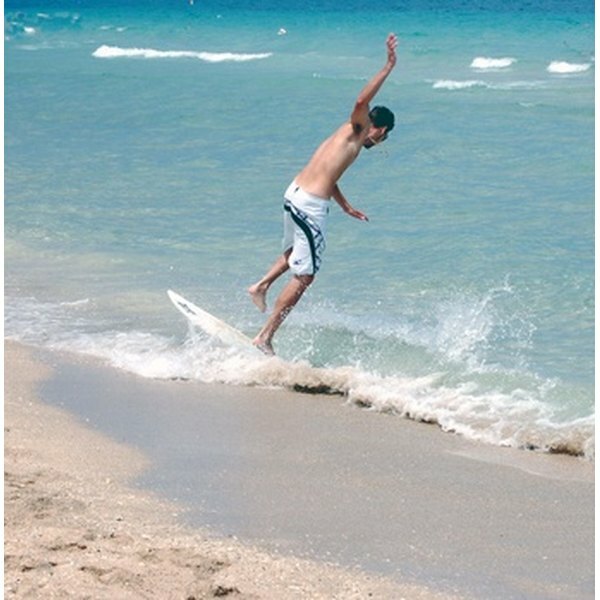 Beginner skimboards need to be light, wide and long, relative to your weight and height. The larger skimboards are better for beginners because they have a greater planing surface, which makes them stable. Small skimboards have less planing area, which reduces the travel distance and stability. Skimboards have standard sizing: less that 50 lbs. is extra small; 50 to 80 lbs. is small; 80 to 160 lbs. is medium; 160 to 200 lbs. is large; 200-plus lbs. is extra large. Always check the manufacturer's size chart before purchasing a board. Skimboards are made from all types of materials ranging from traditional wood, graphite, fiberglass, carbon fiber and even Kevlar. Wood graphite composite boards are perfect for beginners. They have outstanding durability and excellent planing qualities, making the rider go farther. The price and weight of the skimboard is directly related to the material. Wood is the heaviest and least expensive; Kevlar is the lightest and most expensive. Weight needs to be taken into consideration. Beginners need a board weight that is a medium weight. A skimboard that is too heavy adds more friction and will slow you down. If the skimboard is too light, it will be too fast. There are two styles of skimboards: flat sand and waveboards. Flat-sand skimboards are for skimming along the surface of the beach over long distances. Waveboards are perfect for skimming into the surf and riding the wave. Both boards have similar properties with minor changes to the bottom and rocker. Board outline, tail shape and rocker (curve of the board while lying flat) affect the performance of the board. The best style for beginners is a flat-sand skimboard, which has a wider outline, squash-tail, wide square-tail and a small amount of rocker. Larger, fuller outlines in the body and tail will increase planing surface, making the board stable to go longer distances. If you are advancing rapidly and want to ride the surf, you may want to purchase a waveboard with a rounded pintail. Most rounded pintail skimboards provide the same planing benefits with turning ability while on the wave.